If you have never paddled an Outrigger before, do it! 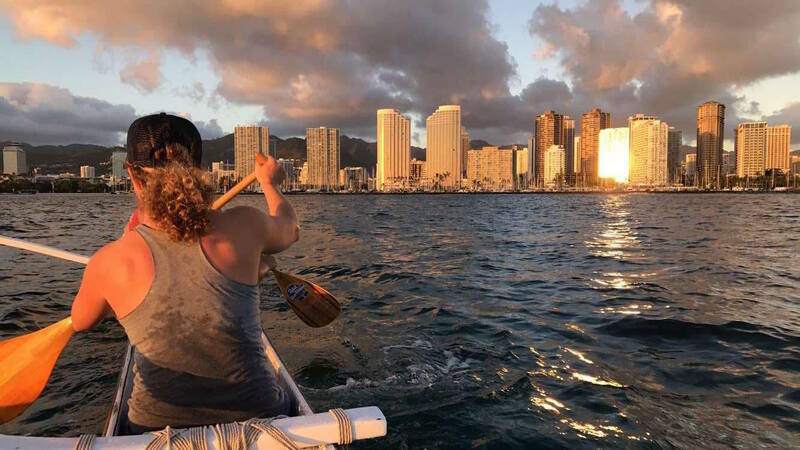 I had so much fun during my first time paddling with travel2change down the Ala Wai Canal, watching beautiful Waikiki in the sunset. We met up by the Ala Wai Golf coarse, right by the canal, where the canoes was located. I got the directions e-mailed from Travel2change beforehand, so it was super easy to find. The host of the event met me there, and he was very warm and welcoming. We had to sign a form and find a paddle each, before we could start with some instruction of basic paddling skills. The instructor asked me if I had paddled before, and I said yes. But he made it really clear that kayaking is nothing like paddling an Outrigger. So I was a beginner after all. Each canoe could fit about 5-6 people, and it was surprisingly many on the event. In total we went out with 6 canoes down the Ala Wai Canal and to the ocean. We got to see the view of Waikiki and Diamond head in the sunset, which was so beautiful. We did not get too much time out on the ocean, because it was really windy, so that was the one downside with the trip. It was a perfect occasion to get to know new people, and do something totally different. At the same time it was so relaxing, as everyone was focusing on the paddling, rhythm and the teamwork. It was almost meditational.